How to remove FRP lock on a Android phone or tablet using a very simple way? Here we will discuss how to remove Factory Reset Protection (FRP) on an Android device. To reset FRP or to remove FRP lock you just need to install a App called "Test DPC" available on Play Store or you can direct download from any mirror link. 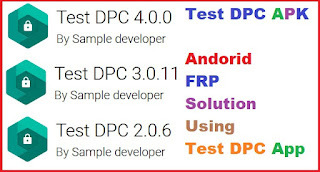 It's so easy to remove FRP on Android using this Test DPC application and here we will describe step by step to use Test DPC app for FRP solution. How to Install Application On Locked Android Phone? How to Enable Developer Mode on Android Phones? Using Test DPC app you can easily remove FRP lock on any Android device mobile phone and tablet. Basically it supports Motorola phones and Micromax, lava and on any other phone you can try this tool to solve FRP problem. Download the latest version of Test DPC or TestDPC all from the below link and install it on the device and follow the below steps to do a hard reset, OEM unlock and FRP unlock etc. Some of the Android phone not support the latest version of Test DPC, So please download the older version of Test DPC to work perfectly. Download Test DPC Version 4.0.0, 3.0.11 and 2.0.6 from the above link and follow the below steps to know how to install and remove FRP lock on Android phones or Tablets. 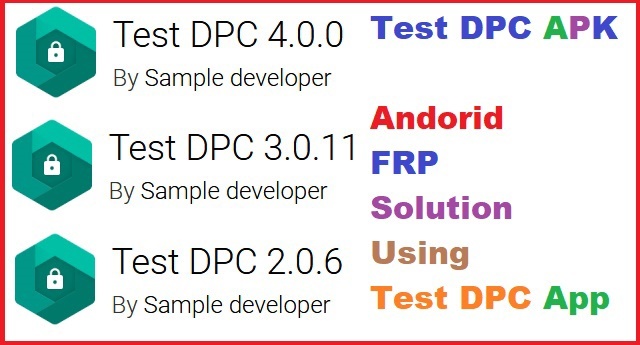 How to Use Test DPC Application For FRP Solution on Android? 2- Open Test DPC Application. 1- Select "Set up device owner"
5- After switch on the phone, just drag the screen from the top side and select Settings. To factory reset the device you need to enable Developer Mode, then enable OEM unlock, then do the factory reset. Battery should be charged to 90% or more.